As a parent, there are days that are etched in your mind forever. The day your children were born. Their first words. Their first steps. Their first days of school. But when you’re the parent of a child with food allergies, you’ve got another memory etched in your mind - the day that you received the food allergy diagnosis. In an instant, it feels as though your world has been turned upside down, and that everything you envisioned for your child’s future is no longer possible. You imagine that every “first” from that point on will be ruined now that food allergies are complicating life. No matter how positive of a person you are, that moment in time shakes you to your core. For our family, that diagnosis day came when our youngest son was three years old. While he had a moderate anaphylactic reaction after two bites of a peanut butter and jelly sandwich just days before, I was still living in denial. I didn't feel that I could handle the reality of what my gut knew was true. That all changed with one phone call, which I received while we were on a family outing to a Thomas the Train event. I can look back at pictures from that day and still feel the exact emotions I had when the doctor said “Your son is allergic to peanuts.” In that moment, it didn’t matter that I was a licensed clinical professional counselor, trained in helping others cope with their feelings; these emotions were too raw for me to process. With such a life-altering diagnosis, it’s hard for parents to rise above the mutiny of negative emotions. After the reality of food allergies sinks in, waves of sadness, anger, grief, and even trauma come crashing in, making it hard to see straight. As is the case with all families managing food allergies, just when I thought I had the hang of living with this unwanted guest, those waves would come crashing in with every new “first”, knocking me back each time to what felt like square one. By the time I was finally starting to feel confident in managing my son’s food allergy at preschool, it was time for him to transition to Kindergarten, where a new routine was needed. Crash! There was that next wave, which in reality translated to me crying uncontrollably the night before the first day at his new school. That pattern seemed to play out in variety of “first” scenarios: the first sports team he joined (Will the team accommodate his allergy? ), the first drop-off birthday party (Will he remember to eat the cupcake I brought? ), the first time he went to a friend’s house for the afternoon (Will he truly only eat approved snacks)? However, somewhere along the way, my goal to just emotionally survive became a goal to teach my son that he could be resilient with this disease, even at such a young age. I couldn’t imagine our family being an emotional slave to this disease our whole lives. But just like the safety instructions on airplanes, I had to help myself before I could help my child. I needed to create a survival raft built from acceptance, knowledge, and resilience to help me keep my head above water before I could help my son build his. I began working towards altering my own internal food allergy narrative, so I could find some way to accept what I couldn’t change. My mind had been stuck in a space filled with negativity and fear, and the battle to save myself from it was intense. The first step was to write down the fears that kept me up at night: my son being left out socially, severe limitations in life, and of course the biggest one, death, just to name a few. Next, I found sources of reputable, evidenced-based food allergy information so I could cut straight to the facts without adding more fear. And finally, craving support and finally being calm enough to accept it, I reached out to those further along this path and asked them how they handled a life with food allergies. This new empowerment made me feel strong enough to better navigate new “firsts”. I was ready to teach my son how to change his internal food allergy narrative to a resilient one so that he could do the same. By this point, my son was nearing first grade, a time when school lunch became a factor. All of those negative, scary emotions started rushing back in, but instead of allowing them to completely knock me over, my raft was already becoming quite strong and actually helped me stay afloat. I researched 504 plans, became involved with the PTO to help shape policies, and created colorful outlines of our emergency action plan for our school epinephrine kits in order to make them fool-proof. Over time, our family more confidently talked about how to handle food allergy-related situations, and even practiced scenarios at home so my son felt prepared with knowledge, too. Together, we learned not to let our fears lead the way. We started to become less panicked and felt more capable of navigating life with food allergies. We had created a family raft and our narrative was on the path to resilience. While those waves still crash in and challenge our resilience today, they seem more manageable thanks to our rafts. The reality of food allergies is that they will affect daily life in some way, and many will be persistent throughout life. Those are overwhelming thoughts that can overtake us if we let them. 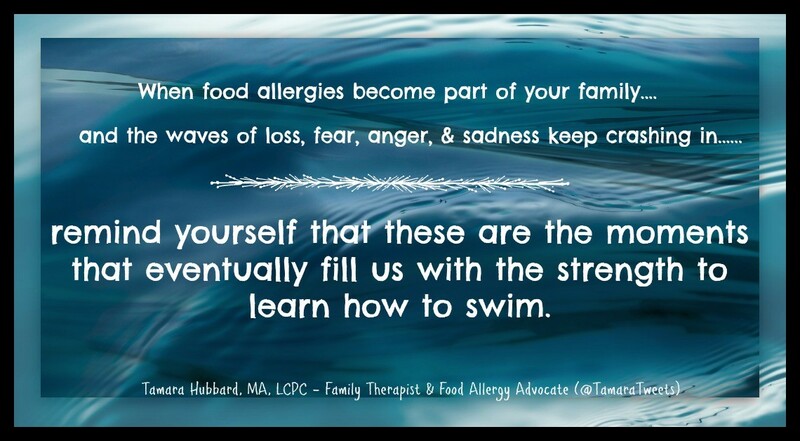 All of us have our own internal food allergy narratives, which guides how we cope with the impacts that food allergies have on us, and also helps determine how resilient our rafts will be. If we want our kids to learn to be resilient while living with food allergies, just as with any parenting task we are faced with, it’s up to us to pave the way towards a healthier internal narrative so that our kids learn that narrative, too. Below are five resilience-focused tips that I use and that I suggest to parents when they need help managing the emotional aspects of food allergies. These tips can help you and your kids begin to build a food allergy narrative that is focused on acceptance, knowledge, and resilience, which in turns aids in the creation of the rafts that will keep you afloat when the waves hit. Don’t Use Labels - When we use labels, such as “my food allergy child”, we give the disease the power to define our child. While it may seem like semantics, phrasing it as “my child that has a food allergy”, helps create the narrative that the food allergy is just one of many parts of your child, not what defines him. Get creative! Together, list or draw all of the parts that make your child who they are, with his food allergy being just one of many. Revisit that list often as a reminder that it is possible to focus on other parts of life even when food allergies seem to monopolize the space. Bulk The Brain - Help yourself and your child find age-appropriate food allergy knowledge that will help you both navigate the season of life you’re currently in. It’s best to learn about the stage you’re currently in, as looking too far in the future can increase panic and fear. (We can’t imagine our five-year olds going off to college, right?). Also, try to stay away from food allergy resources that seem fear-based. Whether it’s through books, food allergy organization websites, personal blogs, or food allergy support groups, fill your brains with accurate information and solution-focused ideas to help navigate through various situations. Knowledge truly is power and a key ingredient in the recipe for resilience. Walk the Walk - That old adage “monkey see, monkey do” is so true! If you want your child to focus on coping with their emotions, navigating tough situations, and developing their own resilience, then they need to see that you’re able to do those things as well. If you find that you’re currently struggling in those areas, it’s okay to reach out for guidance or support to help you through it. Parental self-care is crucial when managing food allergies since it’s a marathon, not a sprint. Flip The Coin -If you find you’re overly focused on those overwhelming emotions, work towards reframing them when possible, even if it’s only for a moment at a time. When a food allergy-related situation does present itself, focus on what went well, what useful lessons you’ve learned, or what you would do differently next time. If your child navigated a situation well, celebrate it! Each success helps build confidence. If the situation didn’t go well, it can be empowering to create a plan and troubleshoot for next time. Challenge yourselves to find a successful solution and prove that you can navigate things. Roadblocks Lead to Resilience - Sometimes, no matter how much we model empowerment and resilient food allergy narratives, our kids get stuck in the negative emotions, and nothing we say or do helps them overcome those feelings. By seeking help from a qualified counselor or trusted support network, you’re teaching your child that in life, there can be roadblocks that feel too big to work through on their own, and that it’s okay to ask for help. As they learn coping skills to break through the impasse, they’re actively paving the way towards resilience. Each family has its own food allergy journey and timeline through it, even though they all share similar emotions. Decide what the goal of your journey is so that you can create resilient food allergy narratives to achieve that goal and free yourself from that fear-based narrative. I look forward to seeing you on this path! Tamara Hubbard, MA, LCPC is the mother of two boys, one who has a peanut allergy. She is a licensed clinical professional counselor, who primarily works with parents and families, as well as a food allergy advocate. Combining her professional and personal passions, she clinically able to help families navigate life with food allergies. You can follow her on Twitter at @TamaraTweets to read food allergy, parenting, relationship, and mom life tips.